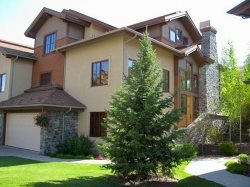 Purchased in 2013, this Downtown Ketchum 3 BR + Den / 3 Bath, Chilali Luxury Condo offers guests hotel-like amenities such as a Gym with Sauna, Game Room, and a Furnished Rooftop Deck with (2) Hot Tubs, Gas Fireplace, and Panoramic Mountain Views. Beautifully decorated throughout, this ~2,500 sq. feet street level 3 BR / 3.5 Bath condo is both private and spacious for larger families or friends traveling together. GREAT ROOM: The great room is the heart of the condo and encompasses the gourmet kitchen, dining and living areas. GOURMET KITCHEN: The gourmet kitchen features a 6-Burner Gas Range with Oven, Stainless Steel Appliances, Granite Counters, and Island with Counter Seating for 3- perfect for snacks or casual meals. DINING AREA: The dining area seats 6 - 8 for more formal meals or gatherings. LIVING AREA: The living area is warm and inviting with Natural Light, Gas Fireplace, Comfy Couch and Chair, and access to the Patio with Gas Grill. Enjoy the game of your favorite movie from anywhere within the great room on the 60" Flat Screen TV with DVD Player. DEN: The den is located down the hall from the Kitchen and features a large, L-Shaped Couch, Queen Sleeper Sofa, and another 60" Flat Screen TV with DVD Player. A great option for kids or those that rather watch their "own" show. BR 1- King Bed, Flat Screen TV, Desk, and En Suite Bath with Dual Vanities, Glass Shower, and Tub. The downtown Ketchum location couldn't be more convenient... Step outside and explore fantastic Restaurants, Shops, and Galleries in between Skiing Bald Mountain, Fishing Big Wood River, or Biking / Hiking the Wood River Trail System- all an easy stroll away from your front door.